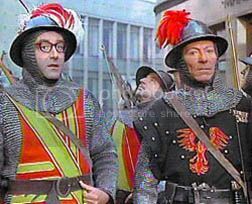 I love Peter Sellers -- when I was a kid, one of my favorite movie series was the mad anarchy of the "Pink Panther" films. I've always been vaguely fascinated by Sellers, his remarkable chameleon acting skills, his chaotic personal life and his sadly early death at 54. Sellers made a gigantic body of work in a short life, appearing in more than 60 movies, many of them apparently kinda awful. I've been trying to catch up with many of the ones I've never seen or haven't seen in years. 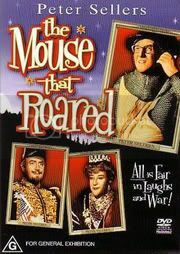 So let's start with "The Mouse That Roared," a cold-war comedy that's a bit like a dress rehearsal for the superior "Dr. Strangelove" a few years later. The story: Tiny European nation Grand Fenwick is facing bankruptcy. Fenwick's prime minister hatches a sneaky plot for Fenwick to "invade" America and lose, thus opening itself up to millions in financial aid (think Iraq or Afghanistan today). But thanks to a fumbling army leader and a top-secret doomsday device nothing goes quite to plan, and Grand Fenwick ends up becoming the most powerful nation in the world. Who's Sellers? : Sellers plays three characters here: the nation's dotty head of state, Grand Duchess Gloriana XII; the sinister Prime Minister Count Rupert Mountjoy, and bumbling army leader Tully Bascombe. Awkward-but-courageous Tully, a kind of Woody Allen-lite, gets the most screen time, although I think my favorite Sellers here is the sneering Count, all mustache and cunning plans. Following in the footsteps of his idol Alec Guinness, Sellers makes each of the Fenwickians distinct characters, never making his multiple roles seem just like a gimmick like, say, Eddie Murphy does. So how is it? "Mouse" is kind of a Mad magazine version of Cold War satire, with many similarities in plot to "Strangelove". The movie is hugely implausible (so everyone in New York City is hiding in bomb shelters and basements over some air raid drill when Fenwick invades? ), but there's an amiable charm to it. It's never a very pointed satire, nowhere near as mad and inspired as "Strangelove," but the idea that a handful of bumblers from a flyspeck nation could somehow hold the balance of world power is still amusing. But the story has a lot of missed potential, settling instead for cliches. Bombshell Jean Seberg is horribly mismatched as a love interest for Sellers, although she's great to look at. It's also funny to see William Hartnell, aka The First Doctor Who, as Tully's stern aide. At 80 minutes "Mouse" doesn't wear out its welcome, and although it's a rather dated piece of satire now, there's enough gentle humour in it to make it bearable. And Sellers' capacity for playing multiple characters never stops being amazing. Quote: "There isn't a more profitable undertaking for any country than to declare war on the United States and to be defeated." I love comic books and have since age 11 or so, but if there's anything I love almost as much as reading comics it's reading about comics. The comic-focused magazine is a admittedly bit of a niche market, and this week we saw the death of what was once the field's heavy hitter, Wizard magazine. Wizard was bloody huge in the 1990s, a comics magazine that took advantage of that whole speculator boom to become about as big as any comics mag ever did. They were glossy and enthusiastic but often juvenile, pandered shamelessly to what was hot and rarely engaged in any serious criticism, but if you read comics for a while there it was pretty much impossible not to give them a read, even if you shook your fist at how idiotic the mag could be. I often felt vaguely unclean reading Wizard. But then amidst the dross you'd occasionally find some sterling pieces; I still remember my old small-press bud Troy Hickman getting a nice shout in there. Wizard lost ground to the Internet as a source for breaking news and their over-reliance on price guides and comics as investment doomed them -- the last time I picked up a Wizard a few years ago I was stunned how small it was. It was a mercy killing. Fortunately, the excellent TwoMorrows publications are still turning out their magazines Back Issue and Alter Ego which focus more narrowly on comics' rich history -- I absolutely love Back Issue, which sticks entirely to comics of the 1970s and 1980s with exhaustive articles on things like Daredevil's relationship with Black Widow or the Japanese Spider-Man TV show. It's basically in spirit a fanzine done up nice and fancy but Back Issue is such a rewarding read every month or two that it pretty much fills my comics 'zine needs. TwoMorrows is smart, too, how their publications basically avoid breaking news, focusing on lengthy homages and analysis of days gone by. There have been a lot of comics mags over the years. One of my all-time favorites was the old Amazing Heroes which during the 1980s was like a more mature, thoughtful Wizard, combining solid journalism with great historical pieces, mixing coverage of both superheroes and then-"alternative" comics skillfully. I picked up a ton of these on eBay about 10 years back and was sorry to have to leave many of them behind when we moved to New Zealand. You can still read an Amazing Heroes about American Flagg and Secret Wars II from 1985 and enjoy it if you're a big enough comics geek. I also loved the old weekly newspaper Comics Buyer's Guide, which I subscribed to for years. It started in 1971 and it's still going as a monthly magazine, albeit probably struggling -- but I admit I haven't really read it in a while either, as the last time I looked it seems geared at an older version of the Wizard fan, and is a bit of a shadow of its old self. And then there's the Comics Journal, which I've always had a complex relationship with. At its peak it's the most vital, insightful mag ever done about comics. Fantagraphics is a priceless company in the comics industry, both for its championing of artists like the Hernandez brothers, Daniel Clowes and Peter Bagge and for its fantastic reprinting of classic comics and comics strips. But the Journal often was a bit schizophrenic for me, often hugely entertaining but sometimes a bit too sneering and mean-spirited for me. I love both Spider-Man and Clowes, and a fan like me sometimes felt excluded by their tone. The unreadably pretentious essays by Kenneth Smith sum up what turned me off about the Journal; space-wasters geared at showing how intellectual the mag could be. 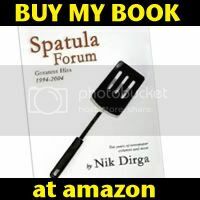 I usually cherry-picked the Journal, picking up issues only with subjects that particularly interested me, and they did depth like nobody else could. A big Comics Journal interview remains the definitive statement of any comics creator's work. Sadly the 'print' Comics Journal has more or less died too, down to semiannual publication -- it's been a year and a half since #300 came out, but Fantagraphics promises a gigantic 600-page #301 is coming soon. I'll definitely pick that up just to see what they come up with, as I do love a good comics magazine read. It's a shame, though, that the glory days of the comic-book magazine seem to be over. I doubt any publication will come along to equal Wizard's mainstream success, even though I won't particularly miss the magazine myself. The world has a surplus of singer/songwriters, sensitive guys with guitars penning odes to their lost loves and such. Kansas-raised Freedy Johnston got a bit lost in the cracks, but his albums hold some great stories, told with a keen eye and a voice that is by turns agonized and hopeful. His breakthrough album on a career that never quite went mainstream was 1992's "Can You Fly," a record packed with finely honed character studies, tales of valiant losers and romantic mavericks. "Can You Fly," his second album proper, was financed by Johnston selling off his grandfather's old land in Kansas, as he notes in the rollicking album opener, "Trying To Tell you I Don't Know" -- "Well I sold the dirt, to feed the band." It's the kind of album that's known to a certain breed to rock critic and a small devoted fan base, but really should have been a stone-cold classic. The far more vapid, high-school journal-style lyrics of Alanis Morissette sold gazillions around the same time. Isn't that ironic. Johnston's vocals quiver, seem barely held back -- the hummable melodies of the songs given great tension by his voice's commitment. Like a songwriting Raymond Carver, Johnston paints character landscapes with a fine eye. Take the elegant, broken-hearted "Mortician's Daughter," where with a few quick strokes Johnston etches an entire world: "I used to love the mortician's daughter / we drew our hearts on the dusty coffin lids. ... We rolled in the warm grass by the boneyard fence / her skin so white, the first leaves falling." I recall listening over and over to "The Lucky One," a singalong tale of a beaten-down gambler's plucky optimism -- "I know I'll be the lucky one," he sings, and it's a call for anyone who ever gambled away on a dream -- whether it was a good one or a disastrous one. Some of the songs grow for me with each listen, like the little masterpiece "Responsible," where a father sees his daughter off to the big city, or the mysterious and evocative title track. It's a distinctly American record -- not in any jingoistic fashion, but in the way Johnston pushes between dogged open-road big dreaming and tiny, brittle setbacks. The wide-open skies and roads of Kansas color "Can You Fly," where ghosts of the past flutter about without ceasing. Johnston went on to produce some other fantastic work -- his next album, 1994's "This Perfect World," is just about as good as this one, while 1997's tightly wound "Never Home" only suffers in comparison to its predecessors. After that, though, Johnston's muse seemed to fade -- 1999's rather lethargic "Blue Days, Black Nights" drowned in its own dark tone and I have to admit I kind of lost track after that. Just recently Johnston released his first album of new material in eight years, "Rain On The City." I haven't gotten around to picking it up yet, because I guess it's a case of worrying you can't recapture that same old magic. 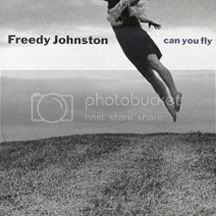 Still, "Can You Fly" and "This Perfect World" are good enough a testament that Freedy Johnston will always rank high on my songwriters hall of fame. One thing I never take for granted about New Zealand, after more than four years of living here, is how accessible the sea is. Most Americans have to make a bit of a trek to get to a beach -- and unless you live in a really temperate place like Florida chances are much of the year it's not a swimmable sea. But Auckland, as I've written about before, has a million kinds of beaches all within a short drive from home. One that I haven't been to we finally visited yesterday, Goat Island Marine Reserve. It's a beautiful spot about 90 minutes north of town where like few other beaches in New Zealand, fish don't worry about being caught and their populations have exploded into life. And the fish -- huge fish all so tame they'll swim right by you unafraid of being eaten. Blue maomao, gorgeous striped red moki, bulge-eyed cod, little bewhiskered goatfish feeding on the bottom of the sea, and giant snapper. The beach is studded with rock formations that make deep canyons when the tide comes in, and as you float on the sea looking down you feel like you're observing entire hidden cities. I only wish I'd had an underwater camera to capture the sights, but here's a few online pics of fish I spotted. I realized that I've never really properly snorkeled before. I've worn one but never in a place where the water is clear as glass and so many tame fish come up within inches of you -- one gigantic snapper who seemed to be the size of my torso scared the hell out of us all. Water magnifies, of course, so each of these great mouthed fish seemed like a dinosaur, hugely confident in their environment. 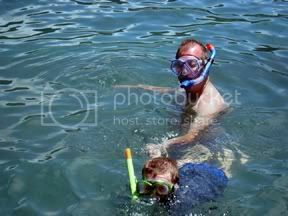 The snorkel takes away one of the big hard parts of swimming, the whole having to breathe thing. With a snorkel I could float, like a spaceman, above the undersea world. It's very peaceful and calming, visiting this other world in the ocean like that. I like my job just fine, but sometimes the hours are a bit unsociable. This last week I had a bunch of 5am starts, which leaves you a wee bit befuddled by the end of it all. So what better way to wind up a week than with some dirty shirt, sweaty rock 'n' roll and the Jon Spencer Blues Explosion? On an extraordinarily hot, sweaty Auckland Friday night, a couple hundred of us crammed into the Kings Arms to perspire away the work week blues. The Blues Explosion have been kicking about for around 20 years now, with a high-octane, borderline kitschy blend of garage rock blues-punk, with frontman Jon Spencer channeling a kind of mad cross between Elvis Presley and Iggy Pop. You can trace a direct influence from the Blues Explosion to the White Stripes, The Strokes, Black Keys and many other popular garage-noise bands, although the Blues Explosion have never quite become household names. But they are awesome fun -- I first heard their classic album "Now I Got Worry" back in the mid-90s living near Memphis, and if I ever just want to bliss out with hard-driving rock 'n' roll, I go with the Blues Explosion. Last night's show was cathartic fun from the word go, as Spencer took the stage in leather pants and at least to me looking curiously like a weathered version of Morrissey. With guitarman Judah Bauer and pounding drummer Russell Simins the trio blasted through 90 minutes or so of all their shoulda-bit hits like "Bellbottoms," "Wail," "Chicken Dog," "Greyhound" and more. Spencer kept hollering out his mantra, "Blues Explosion!" and on this sticky night, no song seemed more appropriate than "Sweat" -- "That's the sweat of the Blues Explosion," he sang, as rivers of the stuff flew off his mop of black hair. Yeah, by the end of the encore we were all pretty ripe and in need of deodorant -- but it was one of those great music moments as little shaved-head guys built like fire hydrants bounced around with high-heel wearing petite bar chicks and one extraordinarily smelly guy who looked like a missing Fabulous Furry Freak Brother. There ain't nothing particularly deep about it, but boy was it fun. 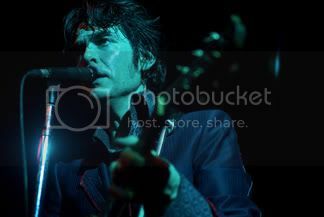 When Jon Spencer put down the guitar to engage in a feedback-lacked theremin solo, I knew I was in something approaching rock 'n' roll paradise and all thoughts of work and normal daily life fled my head. If you can rock a theremin you've got it going on. Long live the blues explosion. I turn 40 this year, too, which is a really weird thing to see on the horizon -- on 11/11/11, no less. My wee boy is nearly 7 and about to enter Year 3 at school. I sort of feel like my entire 30s whooshed by in a blur of babies, newspapers and moves. I moved from California to Oregon to New Zealand, had a high-energy kid, and I guess that accounts for that blurry feeling as we enter 2011. Where did the 2000s go? The world young Peter is growing up in may not have hoverboards and flying cars (yet) but it is very different. P will never know a pre-digital world without the internet, texting, Facebooks, iPods and the like -- he will assume knowledge is all out there instantly, without having to dig around in libraries, just a click or two away (the other day he asked about what eels eat, then said "I guess we can just look it up on the internet"). Before the flashing lights settled deep in my brain"
It's a world where you're never out of touch if you don't want to be, where you don't sit around waiting for weeks for a letter from an old friend you've been wanting to hear from. Just send a Facebook message. ... Not that I'm gonna turn into one of those cranky old geezers complaining about the way things ain't the way they once was. The world of 2011 brings us many wonderful things that make it possible for the world to seem bigger and yet closer than ever before. 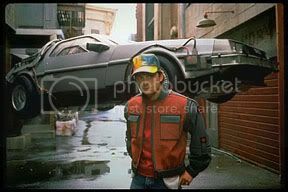 But it's interesting, now that we're actually IN the future of 2011, how different from what we once imagined and yet how futuristic it actually is when you think about it.